Survive the zombie apocalypse by using cards and dice to build your defenses while controlling your own horde of brain hungry zombies! 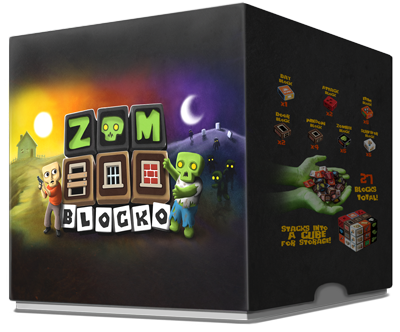 The ZomBlocko game pieces consist of 27 game blocks. Each player has 13 blocks and there is one day block. There are six game play mats, three for each player: Shelter, Supply & Graveyard. There are a total of 50 came cards divided into two categories: Edge Cards and Event Cards. Included is a 30 page rule book that explains how to play ZomBlocko. © 2019 ZomBlocko. App Landing Page By Rara Theme. Powered by WordPress.